Whey and casein are two of the most popular supplemental sources of protein. In fact, several protein powders contain both casein and whey in the same blend. This leads many to ask when spending their money – should I be buying whey, casein or both? Your fitness goal: trying to lose weight? Stick with whey. Trying to bulk like crazy? Add casein to your regimen. Got allergies? Whey protein is gentler on the gut than casein. On a budget? Whey and casein blends can come out cheaper per gram. Meal replacement? A mix of whey and casein digest similarly to real food. That’s the quick explanation. Now here is the whole scoop comparing casein vs whey. Both whey protein and casein protein come from cow milk. For instance, in whole milk: 82% of the protein is casein, while 18% is whey (1)(2). The main differences between whey and casein protein come down to: amino acid content, rate of digestion, and overall pleasantness (3). Amino Acid Content: Whey protein contains greater levels of BCAAs in comparison to casein protein. BCAAs are the most important component of supplemental protein. Rate of Digestion: Whey protein digests significantly faster than casein. This means whey acts rapidly to nourish and repair your body, while casein stimulates a long insulin response as it gradually breaks down in the stomach. Pleasantness: Whey protein appears to digest more pleasantly than casein, due to its speed of uptake. Casein on the other hand is more digestion-intensive on the body and has qualities that can cause irritation in some people. Bottom line: Whey protein is the more popular option due to its superior amino acid content, fast rate of digestion, and pleasantness. In contrast, casein is more of a specialty protein for those needing slow-release protein. 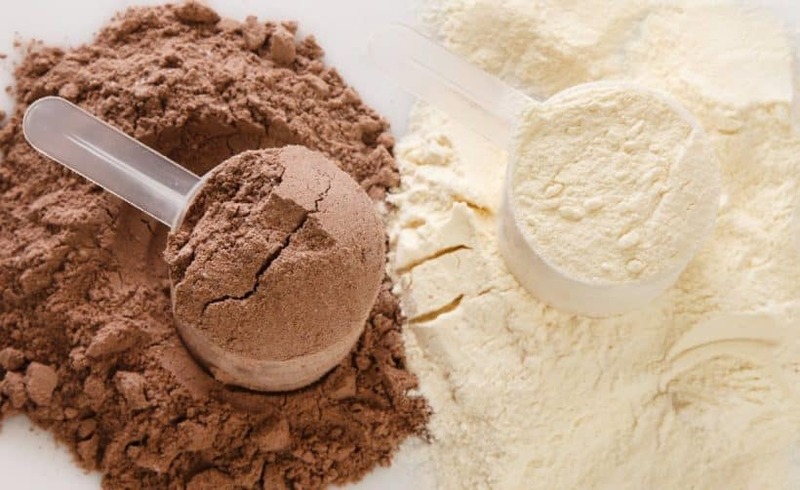 As we originally discuss in our casein protein powder guide, there are several quality grades to look out for with casein. This is based on level of processing, purification and original sourcing. It’s important not to confuse naturally sourced and pure protein from extensively processed for purity protein… Because while extensive processing may produce a well-isolated ratio, the actual tangibility of that protein by the body is often reduced. Casein: The standard casein labeling most commonly refers to calcium caseinate. This is typically a byproduct form. Micellular Casein: This is the higher quality form of casein that you should strive for. Undisclosed: If the sourcing of milk isn’t discussed, then the casein is likely from average grain-fed cows. Grass-fed: If the product states grass-fed, you can count on more care going into your protein form the source, as well as a better overall nutrition profile. Casein is best for: People who simply cannot gain weight to save their lives, and need an easy solution to long-term nourishment. Though, the same goals can be achieved with more proactive whey supplementation. From the start, whey protein is the rarer and more desirable milk product for supplemental usage. Personally, we prefer whey protein over casein and are proud of our whey protein powder ranking here. On that page, we cover all of the following information and more. Milk protein concentrate: This is the rawest source of whey aside from milk itself. Milk protein concentrate provides a mixture of both whey and casein protein, along with plenty of natural milk fats and lactose. Whey Concentrate: Concentrated whey protein has been further purified to be free of casein. Whey Isolate: Isolated whey has not only been stripped of casein, but also contains significantly less lactose and fat naturally occurring in milk. Grass-fed vs grain-fed: Like with casein protein, grass-fed sourced whey protein can mean a big difference nutritionally. This is most predominant in lesser-refined versions, where more milk-fats are present. Grass-fed sourced milk contains greater ratios of healthy, beneficial fats. Whey is best for: The majority of protein powder use-cases. It digests faster, better, and provides a superior amino acid resume. If you’d like to nitpick further, grass-fed whey concentrate and isolate are the best of the best. Final Verdict: should you take casein or whey protein? When choosing between whey and casein protein powders, we do have a preference… And that’s for whey protein. Between the two, whey is a more healthful milk derived protein source. It digests better, stimulates protein synthesis better, and contains far less allergens than casein. Though, both protein sources have been found to improve performance (4). So ultimately, this decision is up to you.